← Rotherham abuse. Which 53 councils shut up shop when people came knocking? Simon Danczuk MP is good on getting the abuse message out there. What about ACTING on information received? Here’s an email to Simon Danczuk MP, from last year, dated 24th May 2013, a month before the above article. In it, I’ve explained my concerns regarding Anna Klonowski Associates. These were the so-called independent investigators, brought in to look at social work whistleblower Martin Morton’s discovery of high level Council abuse against a large number of Wirral Council’s learning disabled supported living tenants. The investigation achieved much, but crucially, was deeply flawed from the outset. I believe the initial lack of rigour in AK Associates’ approach and later lapses allowed council officers and members off the hook. 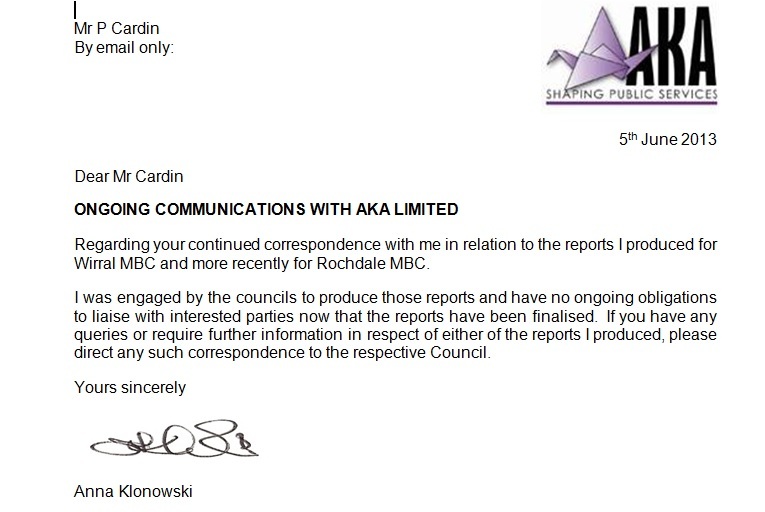 I think you should be made aware that AKA Associates, Anna Klonowski’s consultancy, appointed to look at the Rochdale abuse case, have had some questionable procedures when conducting ‘independent’ investigations. Of primary concern is the fact that AKA repeatedly refused requests to dual-tape-record their interviews with Social Services officers (standard procedure when the police conduct such interviews with suspects). On Wirral, this ‘escape hatch’ has allowed abusers to ‘fly the nest’ with no chance whatsoever of accountability arriving. Indeed Wirral found itself in a position where it could redact the identities held in the report, and apply compromise agreements with gagging clauses to those found to have been involved in abuse towards disabled people. The running total in public money pay-offs is now approaching £1 million. The disturbing aspect is that the abusers are now free to apply for senior jobs elsewhere – and to put the icing on the cake, they are likely to be sued and taken through the courts by the council should they breach their gag and speak about the circumstances of their departure i.e. involvement in abuse. Of secondary concern, but still very important is Anna Klonowski’s apparent failure to declare a prior interest or affiliation with Wirral Council. As you can see from the above linked information, I’m still waiting to receive a copy of Wirral’s External Investigations Policy & Procedure. I’ve been waiting a year for the FoI request, and have even made a recent direct approach for them which has failed. Klonowski DID have a prior association which began in 2006 in the form of ‘governance training sessions’ given to senior officers and councilors. I don’t know whether AKA have an undeclared prior association with Rochdale Council, but this information could be gleaned by looking in the “Openly Local” database of council contractors. Simon Danczuk MP failed to respond. I’d be most grateful if you could let me know whether Anna Klonowski took dual-tape-recordings for participants during interviews conducted for your report. Despite clear requests from many participants, she failed to do this at Wirral. This lack of rigour contributed to a failure of transparency, and no proper accountability for the abusive officers involved. Can you confirm also whether officers found to be at fault within the report have been able to depart their employment and escape accountability? The Independent review at Rochdale was not undertaken as a disciplinary investigation. The Council is conducting its own disciplinary investigations and procedures in accordance with its internal policies and procedures in respect of individual current employees. Referrals have been made to the HCPC in respect of current and past employees. The HCPC will conduct their own assessment and take any appropriate action in respect of Fitness to Practice. Below is an email received today from Rochdale Council solicitor Jane Jameson, which makes a clear admission that there was a failure again to tape record your interviews; interviews which clearly could have been fed into any disciplinary process and, if required, used to support any subsequent gross / misconduct charges. Although the abusive activities (which you found were allowed to go on unchecked) in Rochdale were desperately grave and serious, you again didn’t decide (or perhaps like on Wirral, actively and repeatedly refused?) to agree to the tape recording of interviews as part of your investigation – which would have placed a valuable verbatim version of events onto the record. This lack of rigour may allow or even facilitate complicit or incompetent parties at the council to seek a way of circumventing proper accountability. If this recurs at Rochdale, after Wirral, where no officer has been held accountable to date, the public would I feel be correct if they laid some of the blame for failure at your door. Following your allegedly ‘independent’ investigation, it appears that subsequent events on Wirral – the handing over of approaching £1 million in public money to abusers, even those with connections to serious organised crime; the concealment from the public of the identities of potential abusers; the shielding of abusers from any form of accountability; the drafting up of compromise agreements which allowed the abusers to leave and potentially to take up employment at other unwitting employers – who wouldn’t have known of the abuse due to a “club over the head” of the abuser (the threat to claw back a large proportion of their severance money) threatening to fall should they talk about the circumstances of their departure…………………… it appears there may have been another “stitch-up”. Following the departure of several Wirral Council senior officers, paid off and granted clean bills of health, the only conclusion we can reach is that in these two serious cases, the pursuit of institutional abuse of learning disabled people and the Rochdale grooming of children has been littered with escape hatches for abusive or failing council officers. Identities of council employees have been substituted with “Witness A, B, C”, etc. to further protect them. This entry was posted in General and tagged Simon Danczuk MP; Anna Klonowski; AKA Associates; Martin Morton; Paul Cardin; Wirral Council; Rochdale Council; disability discrimination; learning disabled abuse; child abuse; CSA Inquiry. Bookmark the permalink.